The top-ranking Republican in the legislature disputes Republican Governor Terry Branstad’s assertion that lawmakers “absolutely” knew he was likely to veto nearly 56 million dollars in spending for Iowa’s K-12 public schools. “The governor or the governor’s office had not indicated a veto threat or that they would sign it to me or, to the best of my knowledge, to any House Republican,” says House Speaker Kraig Paulsen, a Republican from Hiawatha. Branstad has said he rejected the spending proposal because he is philosophically opposed to using bonus payments or “one-time money” for on-going expenses. Paulsen says he and other Republicans share the same philosophy — and that’s why the 55-point-seven million dollars in additional money for schools was to be used for one-time expenses, like new textbooks and school buses. “Obviously I supported it and I voted for it,” Paulsen says. 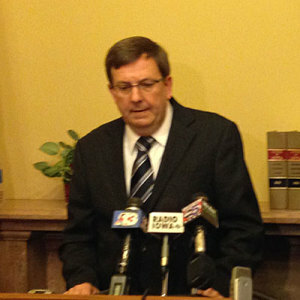 Senate Majority Leader Mike Gronstal — the top-ranking Democrat in the legislature says the governor’s “surprising” action is “especially egregious in light of the fact that the legislature worked in a bipartisan fashion to not use one-time money to fund ongoing needs.” Gronstal and Paulsen both noted the legislature’s overall spending level was actually less than what Branstad himself had proposed in January.